Former Spain defender Gerard Pique was back in international action on Monday night, playing for Catalonia. The Barcelona centre-half, a World Cup and European Championship winner, turned out for the region of north eastern Spain in a friendly against Venezuela in Girona. Also playing were Stoke striker Bojan Krkic, who scored the opening goal, Brighton full-back Martin Montoya and Southampton midfielder Oriol Romeu. Espanyol's Javi Puado secured a 2-1 win for the hosts with a goal three minutes from full-time. Catalonia is not recognised by FIFA or UEFA so the match did not have official international status. The defendants are changed in connection with the region’s unilateral declaration of independence in 2017. Protesters say Pedro Sanchez must resign for holding talks with separatists in the north-eastern region of Catalonia. Local Catalan officers intervened to form a barrier between protesters and another march by Spanish police demanding better pay. 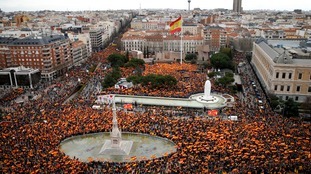 Hundreds of thousands rallied on traditional September 11 marks the Diada, when the Catalan capital fell during the Spanish War 1714. The former Catalan leader Carles Puigdemont must remain in custody during his extradition hearing, a German court has ruled. Crowds are clashing with police in Barcelona as Catalans protest the detention of fugitive ex-leader Carles Puigdemont in Germany. Carles Puigdemont and Spanish prime minister Mariano Rajoy are willing to engage in new talks to discuss Catalonia's future. With more than 50% of votes counted in the Catalan election, pro-independence parties are set to regain their majority, authorities say. As elections go, Thursday's snap regional poll in Catalonia is as unorthodox and unprecedented as can be in Western Europe.